Diack, who led the world governing body from 1999 until Coe took over in 2015, remains under house arrest in the French capital since being charged with corruption and money laundering in November that year. The meeting had been requested by the 84-year-old Senegalese and was due to take place in the presence of Judge Renaud Van Ruymbeke on Friday morning. 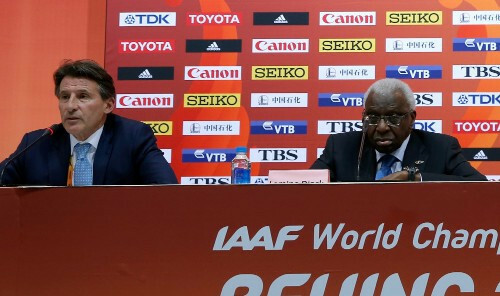 "The IAAF has been informed that the meeting requested by the former President of the IAAF with the current President has been cancelled," an IAAF spokesperson told insidethegames today. "The meeting was due to take place in Paris on Friday, May 25, 2018. "The IAAF understands the meeting has been cancelled by the former President for medical reasons and we are currently awaiting written confirmation." It was made clear that the meeting was cancelled rather than postponed and that a whole requesting process must now take place if Diack wishes to arrange another one. Coe was one of Diack's vice-presidents at the IAAF between 2011 and 2014. Diack, who denies wrongdoing, is suspected of having accepted bribes during his IAAF Presidency to cover up doping by Russian athletes. His son Papa Massata Diack is also being investigated by French authorities for the same offences, as well as claims he accepted a bribe to help Rio de Janeiro win the right to host the 2016 Olympic and Paralympic Games. He is also linked to an alleged scheme to help Tokyo win its bid to host the 2020 Olympic and Paralympic Games. Papa Diack has been on Interpol's most wanted list since December 2015 but is sheltering in Dakar as the Senegalese Government refuses to extradite him to France. The allegations concerning Rio 2016 are especially topical after Brazilian informer Carlos Emanuel Miranda, a former partner of ex-Brazilian Sports Minister Sérgio Cabral, and involved in the alleged scheme, testified this week that payments were made to "African leaders connected to the athletics sector". This was said to have happened shortly before the city was awarded the Games at the 2009 International Olympic Committee (IOC) Session in Copenhagen. It is alleged that at least $2 million (£1.5 million/€1.7 million) was distributed to Diack from Brazilian businessman Arthur Cesar de Menezes Soares and that this helped secure the support of four IOC members who participated in the vote. Diack was an active and influential IOC member until 2012.